The natural sciences develop, people take more interest in the surrounding world, and the role of religion becomes smaller. The heliocentric model of the Solar system replaces the geocentric model. The Great Voyages are changing the worldview and creating the bases for the colonialism. The centuries of 1500 – 1700 is called the period of the scientific revolution. At this time, the natural sciences developed, people’s interest toward the surrounding world increases, and the role of religion decreases. The authorities of Aristoteles, and of the church start to grumble, and scientific research and admiration of the rational mind rise instead. 17th century is called Age of Enlightenment. In astronomy, Copernicus develops the first heliocentric model. Galileo Galilei and Johannes Kepler develop the model further on, and this makes the Catholic Church to persecute Galileo. 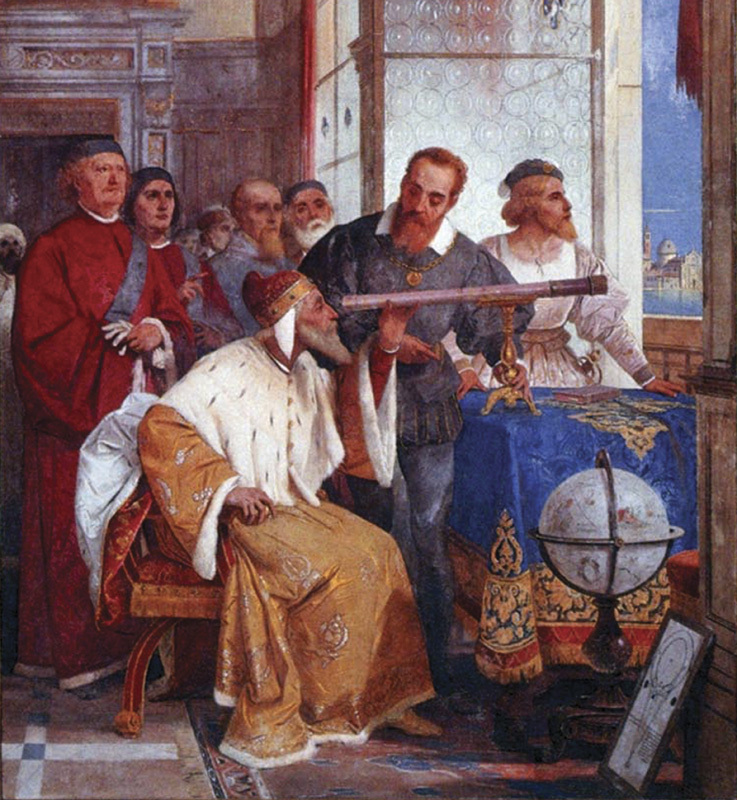 Galileo also improves his telescope, and finds e.g. the moons of Jupiter. Isaac Newton makes significant new findings in physics and in mathematics, and develops for instance famous law of gravity. In 1600’s, chemistry starts to develop into its own field of science, beside the physics. In medicine, the autopsies become more common, as church is losing its power, and many of the views of the ancient Greek are found to be wrong. Robert Hooke discovers the cells in a cork bark using a microscope. The great voyages of discovery change the world at least as much as does the development of the sciences. They not only bring abundant new information of the world, but also set the foundation for the colonialism and the invasion of the European culture, coming in the later centuries. Political and economic reasons are the biggest motivations for these voyages, but they also have a big significance for science. Since the Vikings, Kolumbus was the first European to sail into the American continent in 1492. The roundness of the Earth was known already in the times of ancient Greek, but this was finally verified as Fernão de Magalhães sailed around the world in 1522. Also, a Chinese Zheng He, on his voyage starting in 1405 reached the eastern coast of Africa, but these Chinese great voyages stopped there, due to the change of rule in their home country.